Right now, at Byerly RV Center, we are offering huge discounts at our Extended Show Pricing Sale! From now until Saturday March 9th, you can find show prices on not only our huge selection of new and used RVs but also some of the most important RVing parts and accessories. Let check out some of the deals we have available! Stop by this weekend for our Extended Show Pricing Sale! Motorhomes are the perfect way to hit the open road in comfort and luxury, and at these incredible prices, it has never been so easy to purchase a Class A, Class B, & Class C Motorhome of your own. Like the Winnebago Adventurer 33C Class A for example. 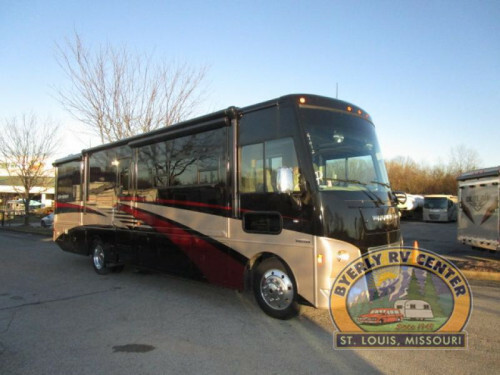 This beautiful RV comes with a spacious floorplan that is packed with amenities such as an outdoor entertainment area, four door refrigerator & freezer, three slides, and even a washer and dryer for those long term stays. This is truly luxury on wheels. Travel in style for less with the low prices on our Motorhomes! We also have plenty of towable RVs for sale at the Extended Show Sale such as fifth wheels, travel trailers, toy haulers, and more. 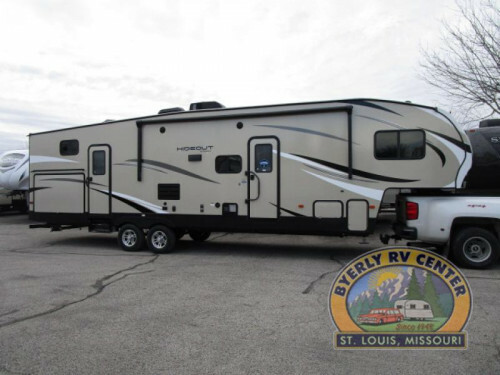 With options such as the Keystone Hideout 308BHDS fifth wheel, you will have a floorplan perfect for the family. You’ll love the bunkhouse and bath and a half design that makes more room for everyone. Plus, additional luxuries like the outdoor kitchen and all stainless steel indoor appliances will take your RVing life to the next level of comfort. Plus with towable RVs available, you are certain to find the perfect camper for the perfect price! At the Show Pricing Sale, you will also find plenty of parts and accessories for discounted prices. Items just as stabilizer jacks, wheel chocks, and a tri-leveler are essential for safely parking your recreational vehicle at the campsite, but we also offer some extras that can just make life more comfortable such a set of folding camp chairs. Get everything you need for your campground stay! 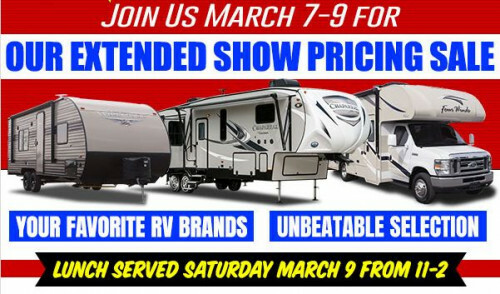 So join us March 7-9, at Byerly RV Center, to save huge on your family’s next RV at the Extended Show Pricing Sale. And be sure to stop by our location on Saturday, March 9th from 11am to 2pm when lunch is being served. To find out more, simply contact us today!